In a time when protesters are occupying Wall Street and everybody is questioning our country’s financial system, Horse Trade Theater Group will present the 2011 Edinburgh Fringe Festival hit, TAKE THE RED PILL! for a special one night only engagement, Wednesday October 19 at UNDER St. Marks. Why is everyone in debt? What is money? Didn't you now that all debts and mortgages are just an illusion!! Discover the hilarious truth with the debut show of one of Ireland’s most original and passionate comedians, Aidan Killian. Aidan quit being a banker at “Bear Stearns” to save this world through laughter "one endorphin at a time." Learn how Aidan dealt with his bankruptcy and removed his 'debt' from the banks with unexpectedly comic consequences. This show is original, powerful, and spiritual as well as being ridiculously funny. TAKE THE RED PILL! will open your mind and then blow it by revealing how the banks and courts are complete frauds as well as leaving you with sore cheeks and a happy smile on your face. 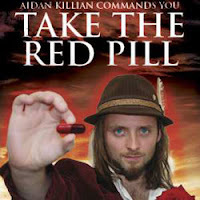 Aidan Killian’s TAKE THE RED PILL! will be presented by Horse Trade Theater Group at UNDER St. Marks (94 St. Marks Place between 1st Ave and Ave A) Wednesday, October 19 at 7pm. Tickets ($10) are available online at http://www.horsetrade.info/ or by calling Smarttix at 212-868-4444.